Atlantic City is a resort city in New Jersey known for its casinos, boardwalk, and beach. Some of you may know its street names well as it was the inspiration for the original version of the board game Monopoly. In the wake of the railway boom, Atlantic City’s first boardwalk was built in 1870 along a portion of the beach in an effort to help hotel owners keep sand out of their lobbies. Atlantic City’s golden age was 1919-1933 when it became known as “The World’s Playground,” as well as for its illegal liquor, gambling and prostitution. After World War II it continued to be plagued by crime, corruption, and poverty, but also economic decline. The latter has largely been attributed to the rise of the use of automobiles and jet service, which allowed people to come and go as they pleased to locations both near and far. In an effort at revitalizing the city, New Jersey voters passed a referendum in 1976 approving casino gambling for Atlantic City. The Resorts International was the first legal casino in the eastern United States when it opened on May 26, 1978. Other casinos were soon built along the Boardwalk and, later, in the marina district for a total of eleven today. In recent years, competition from legalization of gambling in nearby states has chiseled away Atlantic City’s casino base. As a result it is now transforming into a convention mecca and family-friendly destination. Certainly among New Jersey’s cities it has the best hotel accommodations, dining venues, shopping, and world-class entertainment options. And at great value, it offers a lot of convenience and excitement to visitors. Shopping. Atlantic City has many different shopping districts and malls, many of which are located inside or adjacent to the casino resorts. You’ll be able to venture out and explore a few. Several smaller themed retail and dining areas near either the Resorts International Casino Hotel or Bally’s Atlantic City Hotel and Casino, both of which have their own small collection of stores and restaurants, include Spice Road inside the Trump Taj Mahal, the Borgata Shops and The Shoppes at Water Club inside the Borgata, and the Waterfront Shops inside of Harrah's. Major shopping malls are also located in and around Atlantic City. Playground Pier is an underwater-themed indoor high end shopping center located on the Million Dollar Pier formerly known as "Shops on Ocean One." The four-story shopping mall contains themed floors. Tanger Outlets The Walk is an outdoor outlet shopping center spanning several blocks. The only outlet mall in Atlantic County and South Jersey, The Walk opened in 2003 and is undergoing an expansion. The Quarter at Tropicana is an old Havana-themed indoor shopping center at the Tropicana, which contains over 40 stores, restaurants, and nightclubs. Attractions. Ever since Atlantic City's growth as a resort town, numerous attractions and tourist traps have originated in the city. Rolling chairs, which were introduced in the 1800s, have been a boardwalk fixture to this day. While powered carts appeared in the 1960s, the original and most common were made of wicker. The wicker canopied chairs-on-wheels are manually pushed the length of the boardwalk by attendants, much like a Rickshaw. Located on the Boardwalk near Resorts International Casino Hotel, the iconic Steel Pier is an amusement park that extends 1,000 feet over the Atlantic Ocean and features more than 25 extreme rides, kiddie rides, and an amusement arcade filled with fun and challenging games. Helicopter rides up and down New Jersey’s coast can also be had here. 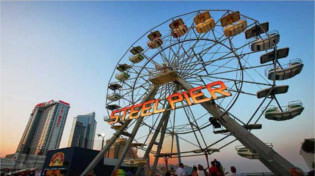 The Steel Pier also features food kiosks, a family pub, and a bar located on the water's edge, which provides a great view of the ocean along with frequent live entertainment. The Absecon Light is a coastal lighthouse located in the South Inlet section of Atlantic City overlooking Absecon Inlet. It is the tallest lighthouse in the state of New Jersey and is the third tallest masonry lighthouse in the United States. Gardner's Basin, which is home to the Atlantic City Aquarium as well as small shops and restaurants, is located a short distance north of Absecon Light. Not all of the possible experiences available in Atlantic City have four walls around them. 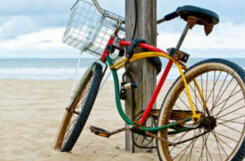 You can learn to surf, give parasailing or bay kayaking a try, go for a sunrise run on the beach, charter a sport fishing boat and guide, or enjoy a bike rental in Atlantic City. Golfers of every skill level have their pick of more than a dozen golf courses that the Atlantic City area has to offer. There are also parks, wildlife refuges, zoos, and wineries nearby. Plus, the ocean temperature approaches 70 F (20 C) by the end of June each year, when Atlantic City’s sands are warm. See the live beach cam here.